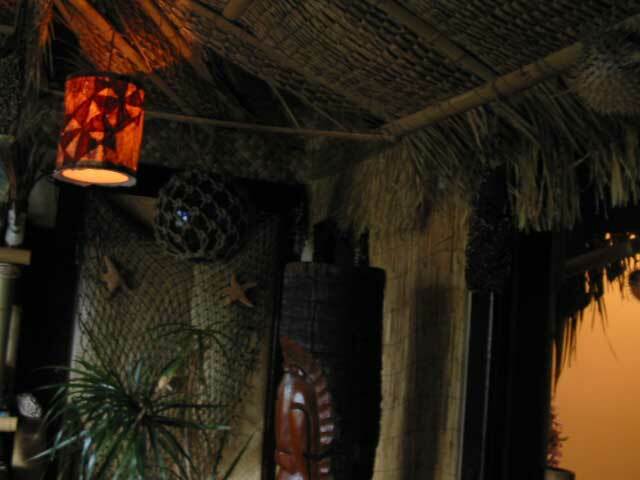 This was the first home tiki bar of Swanky. It was dismantled in December 2004. 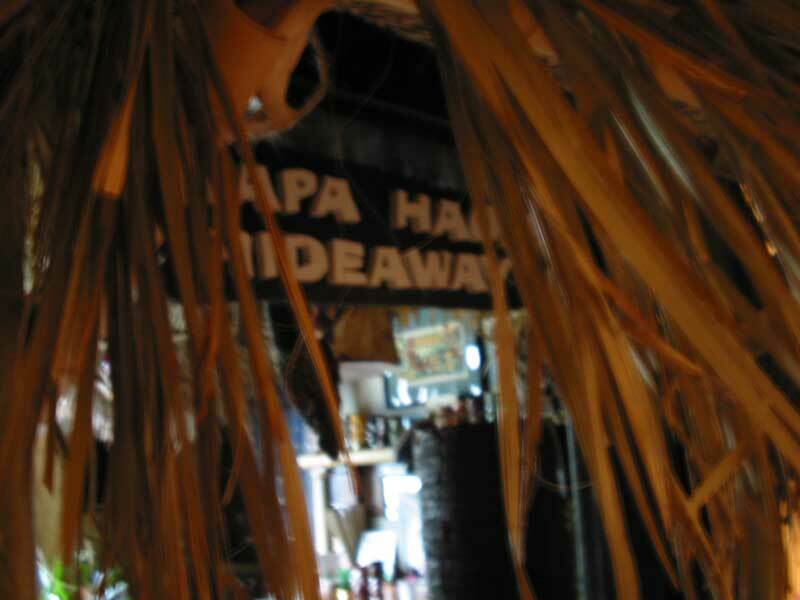 I had the pleasure of entertaining "I Belli di Waikiki", Pablus, TNTiki, Basement Kahuna, Brad Owens of Hale Tiki and many others there. The entrance. 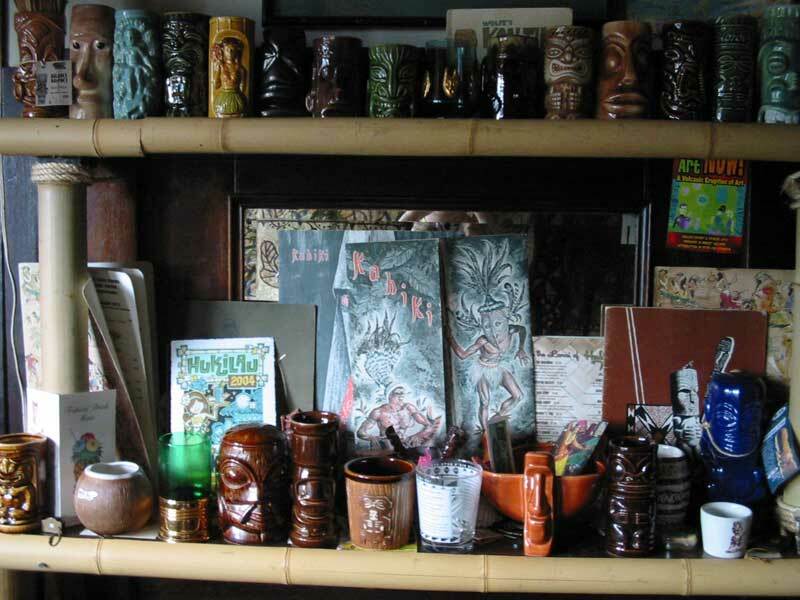 I like my tiki in one place. 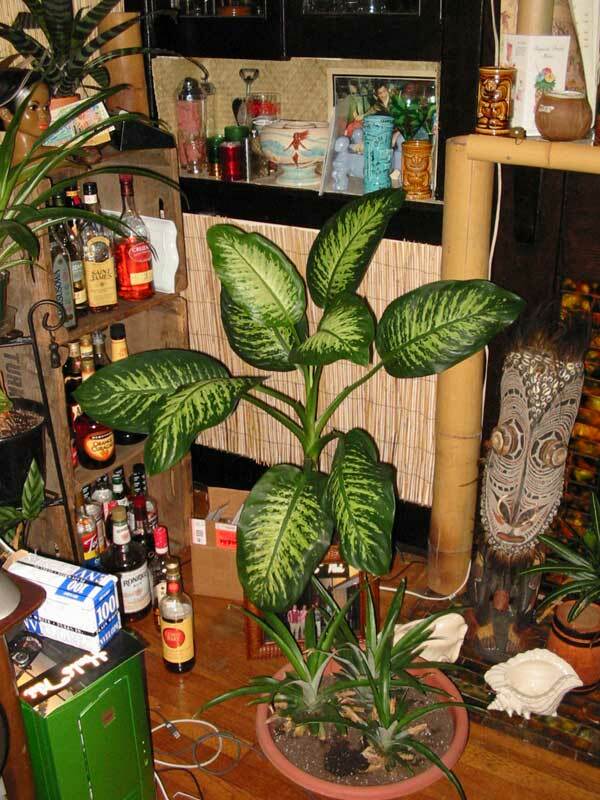 The rest of my house is atomic 50's and the tiki bar is a complete departure to a rough, tropical setting. Everything here is connected to the wall by maybe 4 nails. 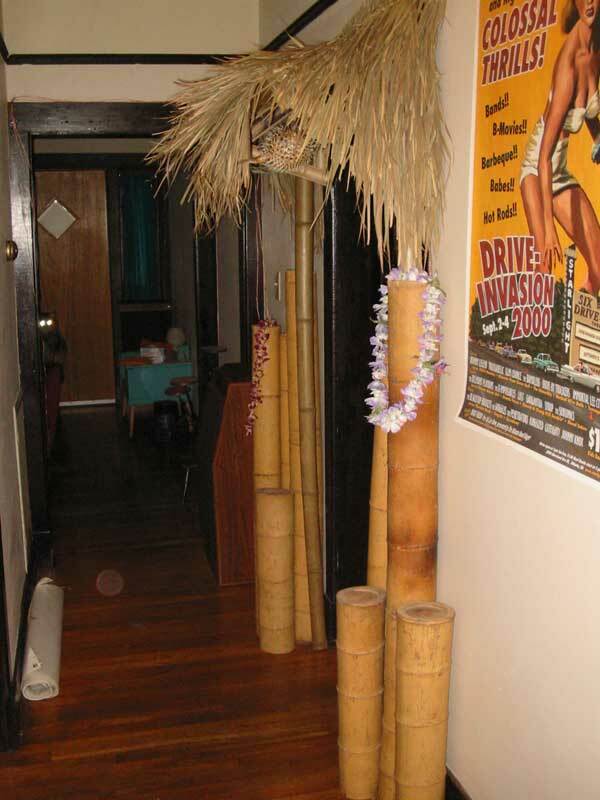 I made a triangle frame of split bamboo and nailed it to the door frame. The side poles are just tied on for looks and the 5" poles are just on end. No support. The thatch is hooked over a few nails in the top of the door. The sign is designed after the Don the Beachcomber driftwood sign. Just behind the sign you can see a PNG hunting talisman hanging. Turning right upon entering, we have the top of the Milan Guanko tiki I found here in Knoxville. He came from a restaurant, but which? Maybe the Blue Hawaii or Mahi Mahi in Nashville? 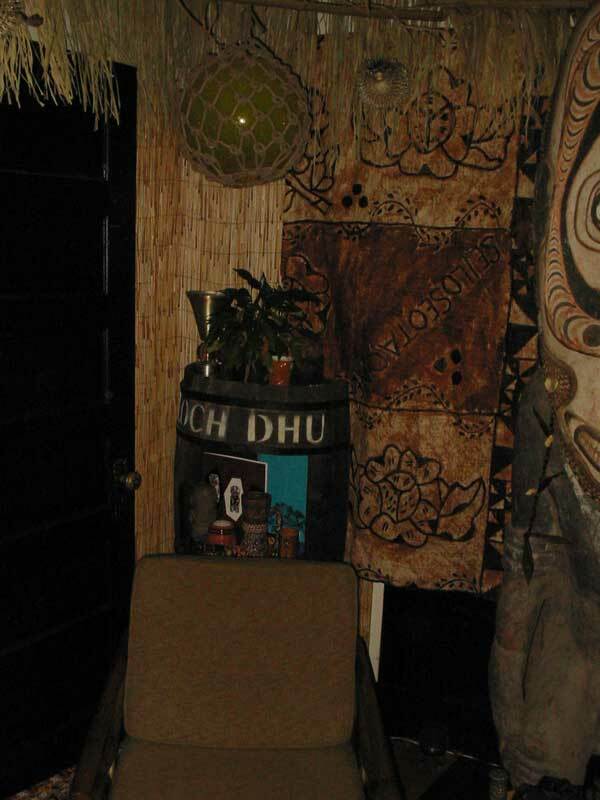 On the wall is an upper Sepik river PNG mask.The lighted lamp was made with tapa cloth from the building of Hale Tiki in Augusta. Walls are covered in reed fencing which is held in place by fishing wire strung through two screw eyes on either end. It runs across at about 3 and 5 feet to keep it upright, and it rests on the baseboards. Minimal footprint. A little raffia at the roof. Another view with a little out the door. This is closer to the lighting as it is, but still too bright. The roof is thatch panels tied to a 4 4 x 4 frame of split 2" bamboo. The 4 x 4 panels were hung by 4 wires dropped from the ceiling and run through a hole at each corner. The four panels meet in the center of the room so that one wire help up 2 corners, one of each panel. 4 wires in the center of the room help up 4 panels. Two more wires help the ends of each panel. 12 wires in all held up 4 panels and the corners were attached to those panels as well. So the entire drop thatch roof and the other stuff attached was help by 12 wires run up to ceiling joists in the attic. This is turning left at the door. A vintage green rattan chair below. The barrel needs to be repainted with "Ron Cubano" some day. 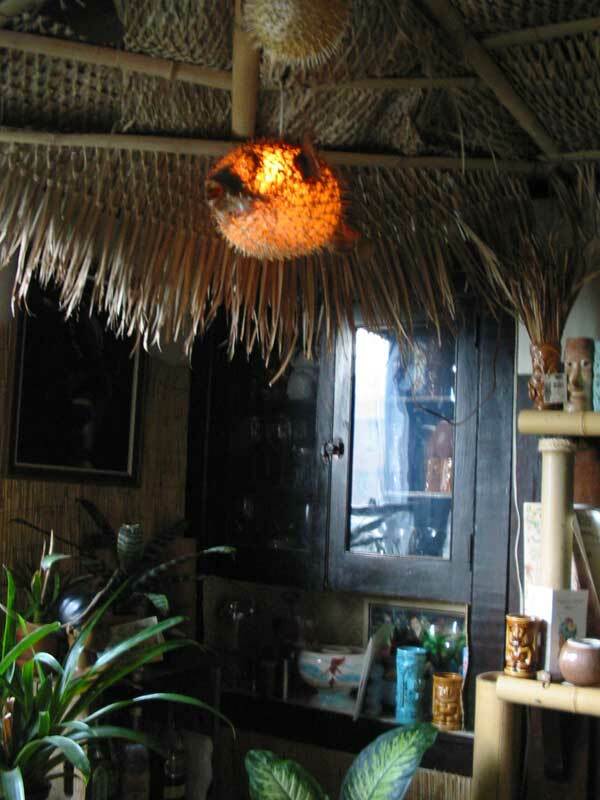 I mounted a light inside it and keep my Mai Kai collection on display there. Back tot he other side. Here you see my Mai Tiki and another PNG piece. 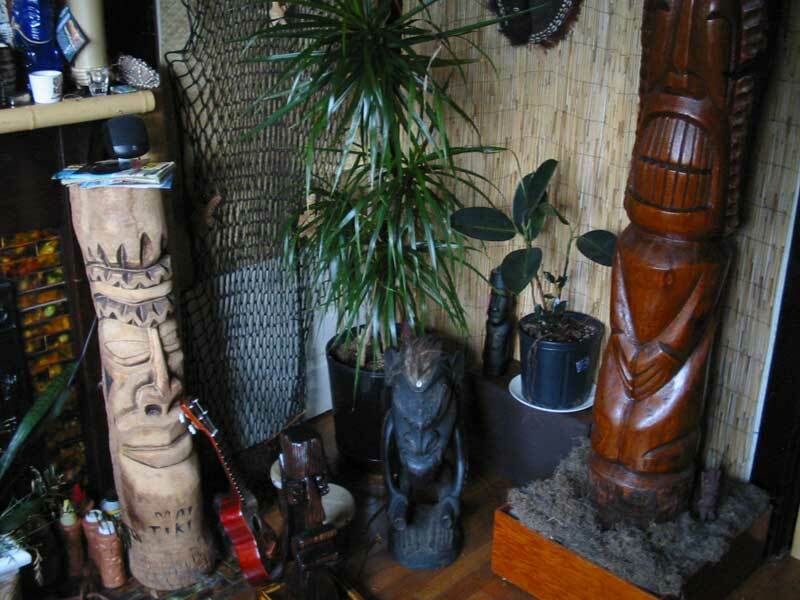 The base of the Guanko and beside it a hunting image from PNG, and my Hukilau "trophy" from Bamboo Ben and Keigs. There is one of the speakers back there. 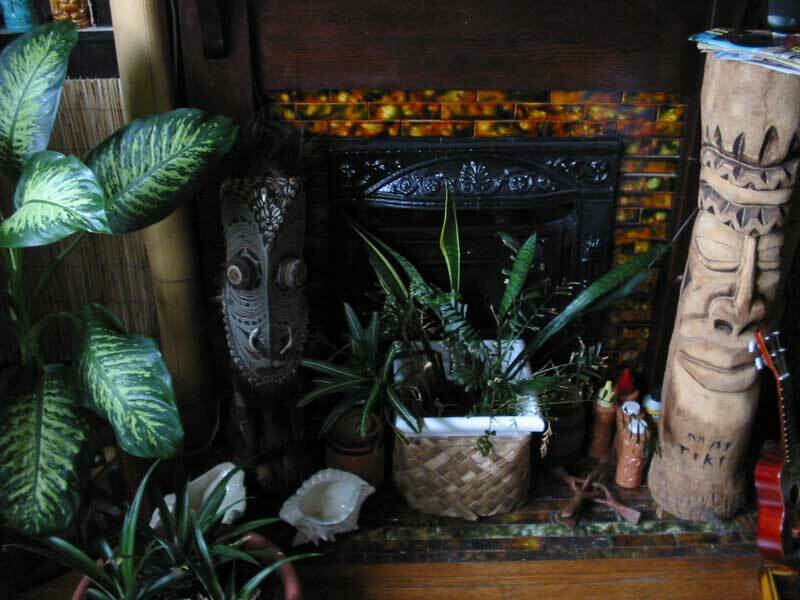 The mantle of the fireplace made a nice display for the mugs, etc.. A little split bamboo made it look right. This bamboo was Georgia grown and harvested by Basement Kahuna. My large lighted puffer fish and the built in cabinet for the drinking glasses. 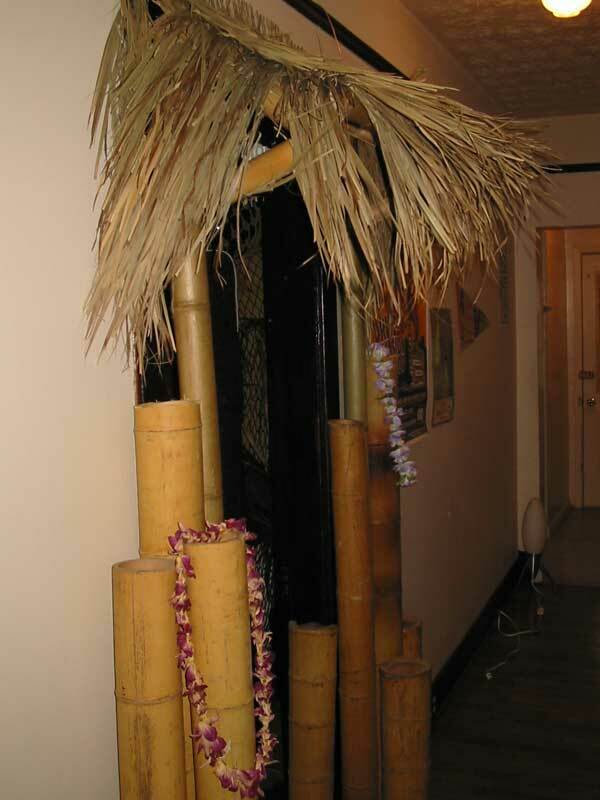 Here in the corners, I attached the bamboo across to the 4 x 4 panels and laid the thatch across it. The big guy. 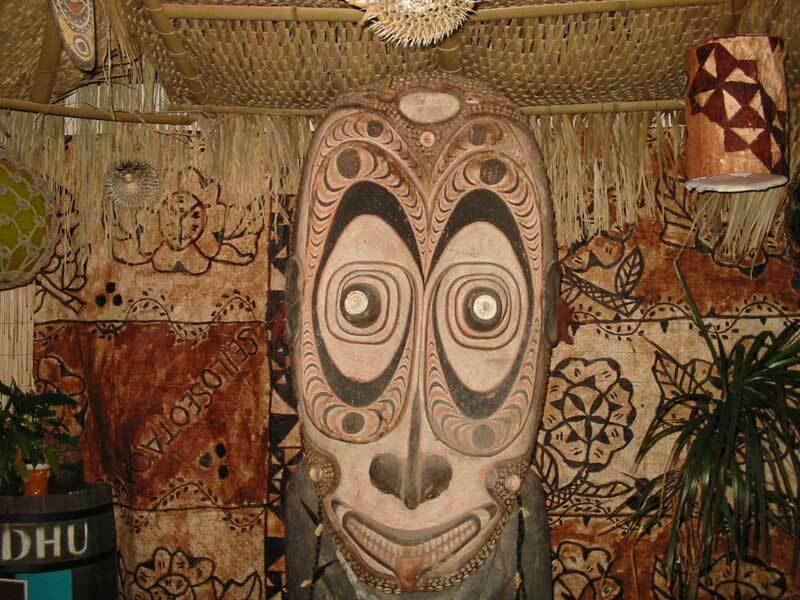 He is a 40+ year old Oratory Table from the Korogo Village in Papua New Guinea. He is about 7 feet tall. 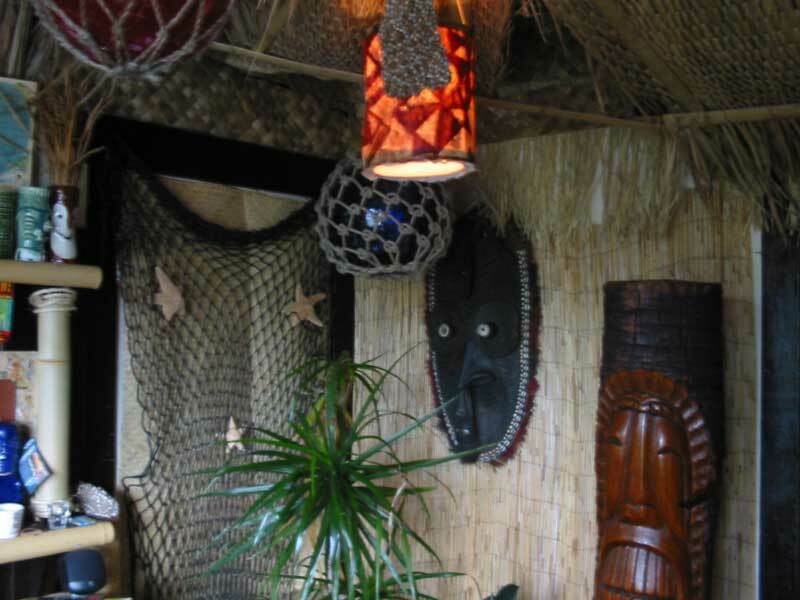 On the right is another lamp made from Hale Tiki tapa. 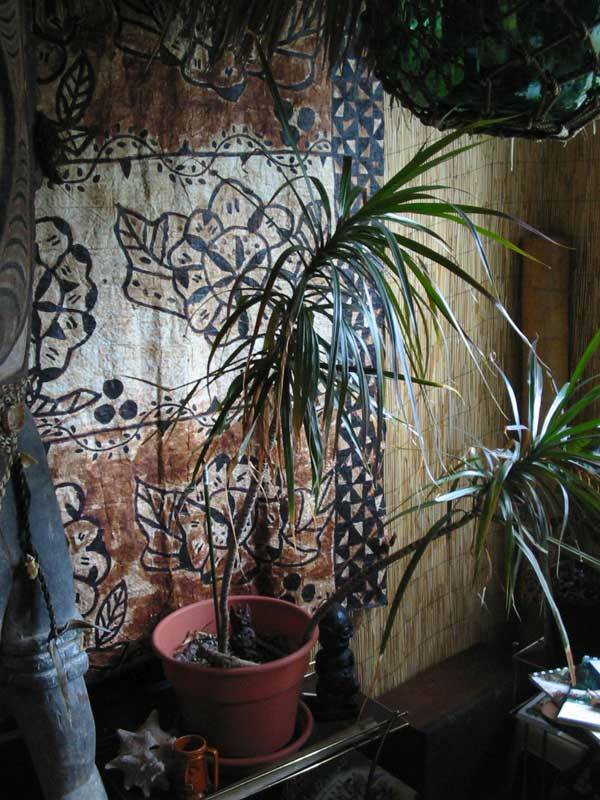 Behind him is a piece of Samoan tapa cloth hung for a wall covering. The corner again with the bar ingredients. Most of the Grog Log was made with just these and the stuff in the fridge.Those are pineapples growing down below. The other corner with the giant fish float. That one is about the size of a large beach ball.